The problem with having landscapes with iconic views is that icons attract bus parties and bus parties are not attractive to landscape photographs. This means if you want to photograph an iconic piece of Skye landscape you either get up really early or go in the middle of winter when all but the most hardy (or cheap) of bus trips are absent. I didn’t have a choice about when I could go. I had been commissioned! We love commissions. They are challenges, they push us out of our comfort zone. Normally when taking a landscape photograph we can pick and choose where and how we get it. This time someone else picks and chooses but they still want it to be recognisably a Landscapes365 image. The challenge was to place the words “Follow Your Dreams” on or about the Old Man of Storr in the manner of our Love Letters . The Old Man was a particular favourite spot of our client’s husband. Surreptitious emails and Twitter direct messages were passed to and fro in the early spring arranging for the picture to be ready for their arrival in Skye on holiday in August. Plenty of time for me to paint any extra letters I needed to make up the message and get up onto the hill and photograph them. You know what happens when you are given a distant deadline. You always leave it to the last minute, well this time I didn’t. For once I was ready to rock well in advance. There is the important Isle of Skye weather rule to seize an opportunity as you never know if the sunny day you are waking up to could be the last for months. 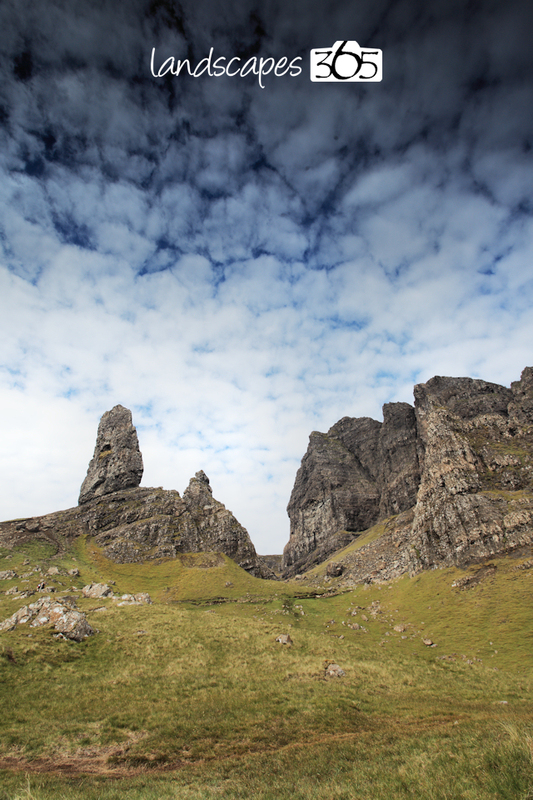 That was why I appeared at the empty car park below the Old Man of Storr at 7am one late June morning. I was determined to get up to the monolith before bus loads of curious and noisy tourists were swarming all over the place. I didn’t want to be spending all my time explaining what I was doing. 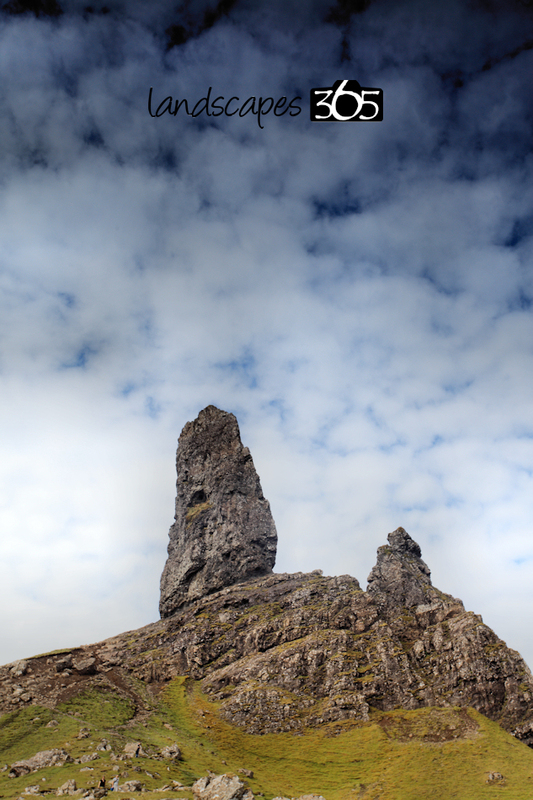 This was my first visit to Storr and I had no idea of what was ahead. I was quite excited. I strode off up the well worn path, actually it is more of a groove worn into the rock, charting the easiest route up the hill. I was carrying a rucksack with all my camera gear, a lightweight tripod and hessian Tesco shopping bag with the 16 wooden letters that I needed to make my message swinging on a karaabiner attaches to my rucksack . I had also brought the Assistants though I didn’t see much of them. They had leapt out of the car in their usual fashion – I unlock the boot and the tailgate is forced up and out of my hand by a great big hairy and enthusiastic canine explosion. As this was their first visit to the Old Man they went into their default setting when in a new car park, they ran for and waited at the nearest closed gate. That always takes them somewhere interesting. The path wound its way onward and upward through the obligatory forestry plantation. How we regret the short sighted greed of previous generations who surround all of our areas of outstanding natural beauty with ugly linear forests of alien trees. Much worse is the ugliness and devistation left behind after the trees are cut down. The huge ugly scar of tree stumps a harvested plantation leaves behind is appalling and takes years to heal. While I fulminated on this I made my way higher and higher. I noticed that I had no idea where the Assistants were. They had disappeared off into distance the second I opened the gate. I was fairly relaxed as there is never usually anything that they shouldn’t meet in a plantation. Sheep seem to avoid them as do deer, in fact a forestry plantation is the quietest place I know. There is nothing there other than row after row of closely packed trees, no animals or birds, it’s only the midges who seem as populous there as anywhere else. The Old Man from the path. It does look like it is about to slide down that slope. I eventually caught up with the Assistants at another gate on the far side of the plantation. My first view of the rocky outcrop with its enormous amphitheatre called the Sanctuary curving round the great pinnacles left behind after countless millennia of land slips that has become the Old Man and his lesser fellows. Impressive, imposing, and big enough to impose over us even though there was still quite a walk before you reach the rocks. I was the only person there. I certainly didn’t have any dogs. After making sure there were no sheep I opened the gate and told the they could run. They saw the wide open spaces below the Old man and they went off on great arcing runs across the slope woofing the doggy version of Woo-Hoo! The wide open space is barren and rocky. There is a thin layer of soil over the rock beneath. The grass on top has been well manicured by sheep, though there were none in attendance when we were there. There must have been quite a few there recently. The entire landscape was covered in sheep poo. Tons of the stuff. Even though there were none of the woolly lawnmowers in sight. Sometimes I think sheep actually poo more than they ingest. It is unbelievable how much of Skye lies underneath a layer of ovine crap. Luckily you have to get up close to notice it. When you look up from the tree line you see a vast steeply sloping hillside curving around you with what looks like a film set at the top of it. An experience of an alien world. I expected pterosaurs to be flying over head. It is not…normal… and is even more unusual to have something this weird all to yourself. Nobody else except for two tiny dots barking their delight from further up the slope in the distance. Their tininess giving scale to the vast menhir looming out from the cliff. I wended my way up the little canyon towards the Old Man. If it rained I imagined this would suddenly become a funnel of foaming crashing water. Lucky it was a lovely warm morning. 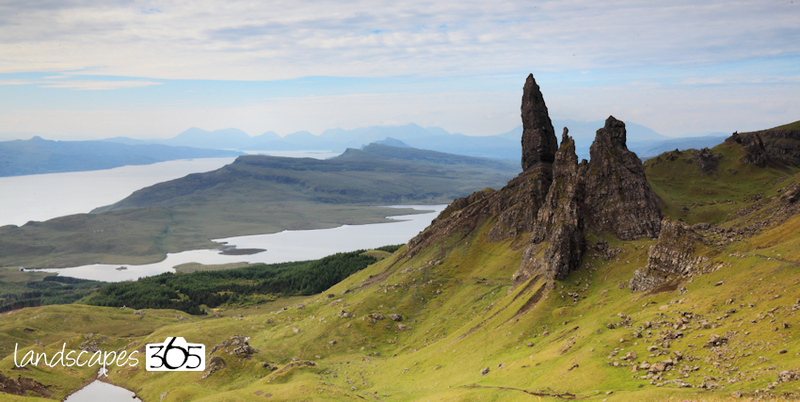 That’s something else strange about The Old Man of Storr, other than a tiny little lochan about half a mile from it there is no water. Everything in Skye is normally close to water, be it burns, streams, rivers, lochs, lochans, pools, waterfalls or bogs there is always water. There was none on the way up to the Old Man. This caused a problem for Junior Assistant who had run himself dry. Such had been his enthusiasm he was exhausted before we reached the top and was desperately thirsty. His tongue was tripping him up and he was making a most alarming wheezing sound. My first attempt. Failed. I felt that every time you look at it your head tilts to the left. Once at the top I had to sacrifice most of my water to rehydrate the idiot dog who once he was refreshed shot off on his helter-skelter pell-mell adventures again. I had a wander round the Old Man. In the Sanctuary there are signs warning you not to enter as there is the danger of rock fall. That must mean it’s really cool there! The lure of a bizarre rocky landscape was too much too. I went round behind the pinnacles and entered the arena. Nothing fell on me but it was spooky and I expected a big rubbery lumbering monster from the Dr Who of my youth to appear from behind some of the boulders. Meanwhile ravens made their croaking presence heard from the cliffs above. There was just too much atmosphere to take in. It was an enormous gothic experience from the imaginations of Mary Shelley, JRR Tolkien, Peter Jackson and Steven Speilberg. There should be orcs and trolls chasing dwarves, knights and terrified hobbits over the rocks. What we did have was two demented dogs chasing hooded crows and small birds around the rocks and a large bloke with a shopping bag swinging from his rucksack. Once I had lapped the pinnacles I took off my rucksack and sat on the grass to the west of the Old Man and took in the view. It was as I expected spectacular. There is a thrill in having such an awe inspiring piece of natural beauty to yourself. To be able to sit and enjoy a tiny feeling of ownership – this is all mine. Well, probably for at least another hour. If I had an hour I thought I should get a move on so I had a few attempts at positioning the letters at various points around the pinnacle but nothing made me happy. I ventured over to a promontory to the north of the rocks. That was better. This was when I saw other people for the first time. Two women were heading past me on the path below that takes you round the end of the cliff and eventually above the Old Man to get a spectacular view across to Raasay and beyond. They were so small in the landscape I could barely see them but the Senior Assistant galloped off to say hello. I stood on my promontory bellowing after her. It made a terrific echo around the cliffs. Birds took to the air and for once the Senior Assistant listened and came back. The power of acoustics! After getting what I hoped was a shot our client would approve of it was time to head home. As we clambered down – the well worn path is a lot easier on the way up – I noticed that there were lots of people appearing on the path out of the trees. It was nearly 10am and the buses will be arriving. Tourists staying in the B & B’s will have had their mighty breakfasts and will be fighting over a space in the carpark. I had definitely picked the best time to arrive but probably I should have left a little earlier. The Assistants will be spreading fear, panic and consternation amongst the masses below. Actually they didn’t, they had run themselves almost to a standstill and were content to give most people a wag of the tail as they passed but not much else. The Assistants take in the view. When I arrived at this spot I had to clean away a huge amount of sheep droppings. It seemed the sheep liked the view from here too. It is an almost daily battle between me and sheep. They want lots of their poo in my pictures and I am equally determined not to include it. Near the carpark the path loops side to side like an alpine road which afforded myself and the now secured on leads Assistants a marvellous view of some German ladies going to the toilet very publicly under some trees in the middle of the loop. Both the Assistants and I didn’t know where to look and I was so flustered I forgot to offer them some of the Assistant’s poo bags. Once back at the chaotic car park I sat in the rear of the car with the footsore dogs sharing the biscuits I had brought to go with the flask of coffee that I had decided to leave in the car due to it weighing too much. I lasted about 5 minutes watching the mayhem – It was like being outside a shopping mall on Christmas Eve – till the pressure from people wanting my parking space grew too much. When a wonderfully polite tourist from India asked if I would mind him waiting for my space I immediately moved the car. Learn a lesson impatient rude drivers. Not only am I taking in the view I am doing some subtle advertising on behalf of the Assistants. Later after the pictures had been downloaded and edited I sent some to the client who approved one from the outcrop. It was printed and framed and presented to her unsuspecting husband when we met up to give him a unexpected photo walk. After the walk he was presented with his picture. He looked quite emotional his wife looked relieved that the months of outrageous sneakiness were finally over. We love what we do. We love it even more when we can make a client smile (actually if we can make a client cry with happiness then we feel really good). The satisfaction that comes from completing a commission is immense. It is a little triumph for us if our picture is put up on someone’s wall. That triumph is a little greater if it is an image the client had a hand in creating.